Artist statements for Re-Writing the Streets: The International Language of Stickers are starting to come in. Here is one from Dave the Chimp. 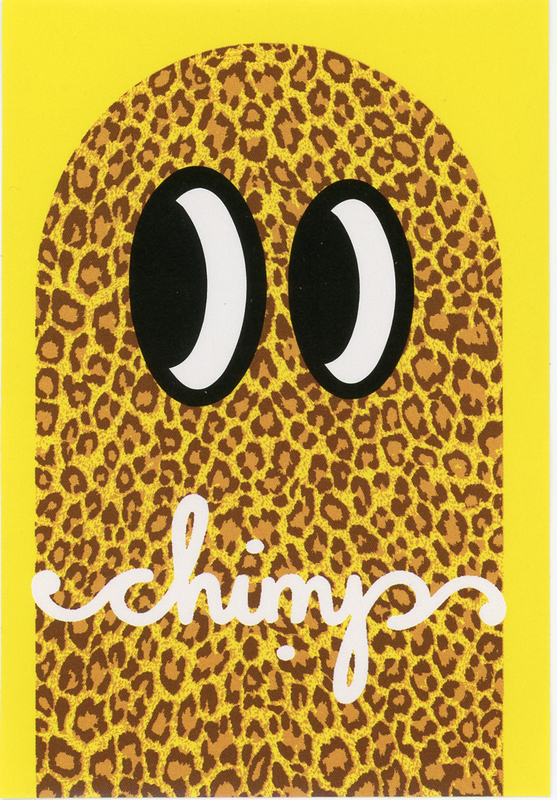 My name is Dave the Chimp. I became a Chimp, among other reasons, because I was sick of humans. I’ve learnt to deal with them a little better these days! I’m a skateboarder, and stickers are part of my culture. “Send a buck for stickers and catalogue” is a phrase that was burnt into my teenage mind while reading skate magazines, and you can bet that when I finally got to visit America I stuffed a lot of dollars into envelopes! Stickers are like currency in skateboarding. Handing out stickers is like giving alms to the poor. If you ever saw a pro at a contest, surrounded by kids, you’d understand what I mean! All those grabbing hands! Skateboarding has always been a punk rock, DIY thing for me. The first time I saw friends make stickers it was skateboarder friends (The Chocolate Animals, around 1989/90). It was amazing to me that teenage kids could make their own stuff, even if it was something as simple as screenprinting stickers. I still find this amazing, but more of my amazement comes from the fact 99% of society DON’T make things, don’t enrich their existence with self-propelled creativity. I guess pushing on a skateboard teaches you to be your own engine. I started to make fanzines in the early 90’s, and paint in the street around 1998. This wasn’t graffiti. And it sure as hell wasn’t Street Art. It had no name. I just did it, and the only thing I can think of that it was vaguely like were the home made rubber stamp stickers by ZEEL that I’d seen on lampposts. I had also made rubber stamp stickers, that I gave away with zines or to people I met at parties. It wasn’t until five years later that I became aware there was some kind of scene forming, with stickers being the “gateway drug” into what is now called Street Art. The vast majority of my street art has been painted – putting up stickers always seemed more like tagging, and I’ve never been in this game for the fame, only the self-expression and adventure. And besides, you need to walk around to put up stickers, and I find walking primitive, always choosing board or bike for my transportation needs. Lately however I’m finding myself in a sticker posting frame of mind, probably because, as a father, I now walk more, and often at a much slower pace, stopping to look at every ant and pick up every stick. I even got into making handmade stickers while spending a week with BO130 and Microbo in Milan, which shows that, even pushing 40, the teenage kid inside is still alive. Long may he survive!